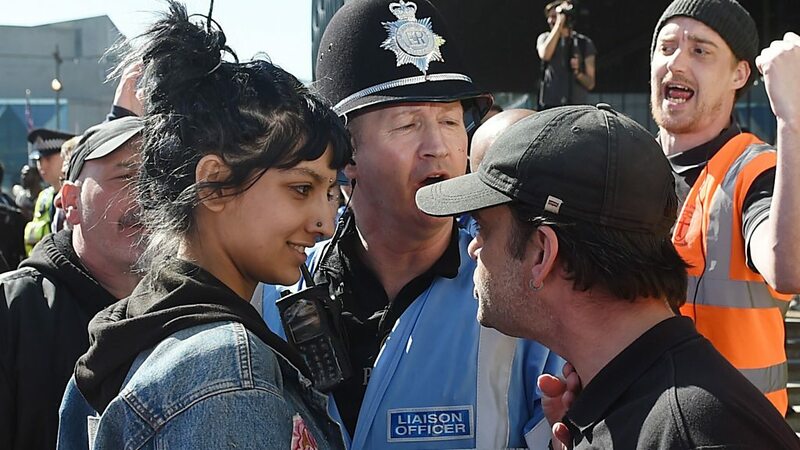 It is less than two years since Saffiyah Khan’s calm smile, inches from the face of an English Defence League activist, made global headlines. But since then, she has gone through a frenzy of activity that has taken in everything from the catwalk, to making a film with the BBC, to performing with ska revivalists, The Specials. That photograph of her coolly going toe-to-toe with a protester was seen by thousands and described in The Guardian as a symbol of the city “standing up to the far-right group”. But that has become a distant footnote to the story. She now appears on The Specials’ new album, Encore, with Ten Commandments – a personal riposte she penned based on a track by one of the forefathers of ska, Prince Buster. That very approach to life saw her walk on stage for the first time to perform the track with the band she now regards as family at London’s 100 Club last Friday. It was also the first time in almost 40 years – since the release of More Specials in 1980 – that the band debuted new material with Terry Hall on vocals. The band ribbed her about how excited she was. But this was after finding out The Specials’ recording of Ten Commandments had taken place at the same mixing desk that produced Exodus by Bob Marley & The Wailers in 1977, so what did they expect? “I didn’t care. I was thinking, ‘I might never do this again’,” she said. The Ten Commandments of Man was a hit in the United States for Prince Buster in 1965. But some of his lyrics – such as “Thou shall not provoke me to anger, or my wrath will descend on your heavily” – are an uncomfortable read for 21st Century eyes. Horace Panter, bass player and founding member of The Specials, happily admits the Prince was a big influence on why he started things in the first place. “The band had done a cover of Enjoy Yourself and sampled Al Capone on Gangsters,” he remembers. “But Ten Commandments has not travelled very well, and from listening to it again it felt important to do a contemporary version. It led to the idea of turning it “completely on its head” by getting a woman to do the vocals – and getting Khan onboard injected real excitement. “And, you know what – she bit our hands off,” Panter says. After masking her excitement at getting the call from Hall, Khan was suddenly faced with having to come up with the right words. But she had a mental block for months before she found the right words, namely: “Thou shall not listen to Prince Buster or any other man offering kindly advice in matters of my own conduct”. “I only got the lyrics written finally the night before we recorded it,” she says. “For ages I’d been telling them I was sorted, ‘but, I’m not near my computer at the moment, so I can’t send them to you’. Despite clearly pointing out how blatantly sexist Prince Buster’s original lyrics were, Khan is quick to state her version is not a “man-hating track”. “It’s [also] not saying to women, ‘Throw away your make-up and become a militant feminist’,” she says. One day last summer, after five or six takes, Khan nailed the track in the studio. And it was a very similar story at the 100 Club, a gig set up to mark the end of BBC 6Music’s Independent Venues Week, led by DJ Steve Lamacq. “When she arrived, the first thing Saffiyah said was ‘I’ve never done this before, I don’t know how it works’,” says Panter. No-one needed to worry though, as the track was one of the highlights of the hour-long set. “When we got up for breakfast on Saturday, we all still had smiles on our faces – it was great,” adds Panter. Since its release last week the track has split opinion. Rather surprisingly, Panter points out that it has gone down particularly well in the US. “If there are people finding it too radical, too feminist, too liberal, there are a lot of people who are saying it’s not radical enough,” Khan says. But that it has provoked strong reactions on both sides suggests it is a statement much-needed in the current political climate, she adds. Her continued presence, it seems, is important too. Khan has just confirmed that the 100 Club performance has led to her securing a slot on The Specials’ upcoming tour of the US, Europe and the UK. Panter cautions people not to be fooled into thinking she is some representative of “the younger generation”. “Most young people don’t think about politics. But Saffiyah really is at the cutting edge of something,” he says.